Guy Ransom, commercial director at Finn Geotherm, has been enjoying the benefits of a heat pump in his home since 2010. Guy’s five bedroomed detached home in Hopton, Suffolk, is a converted pub. 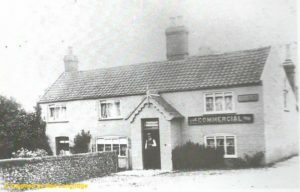 Originally built in the 1800s, the pub – known to locals as The Commercial Inn – underwent major refurbishment in 1978 but closed in the 1990s. When Guy and his wife Claire purchased the house in 2009, it was still laid out as it had been during its years as The Commercial. They set about undertaking major works to transform it into a family home. The conversion project took two years, including major reconfiguration of all the rooms and the removal of 400 tonnes of tarmac to turn the former pub carpark into a landscaped garden. Throughout the entire building project, Guy chose environmentally friendly or sustainable materials wherever possible, as well as fixtures and fittings that would require minimal ongoing maintenance such as UPVC soffits and gutters. 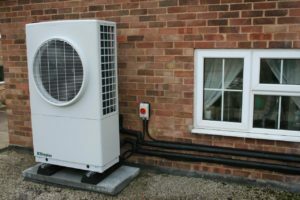 When it came to heating, he wanted to take the same approach and, after carrying out some research, Guy found an air source heat pump was the ideal choice. 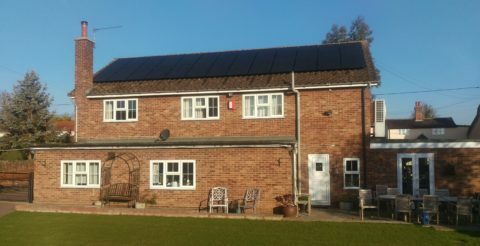 The installation by Finn Geotherm of Guy’s heat pump actually took place before he was part of the company – and it was this meeting with technical director David Alston, which led to him joining Finn Geotherm! Finn Geotherm specified and installed a Dimplex A16 air source heat pump and combined 300l hot water tank with 100l buffer. The heat pump was installed on the flat roof above the kitchen, with the cylinder located inside an existing cupboard. The heat pump has delivered other associated advantages too – removal of the oil tank has created a space for a greenhouse and Guy no longer needs oil deliveries made by a large tanker which has to park on the busy main road through the village. The heat pump system itself is very low maintenance and expected to last twice as long as a conventional condensing boiler.